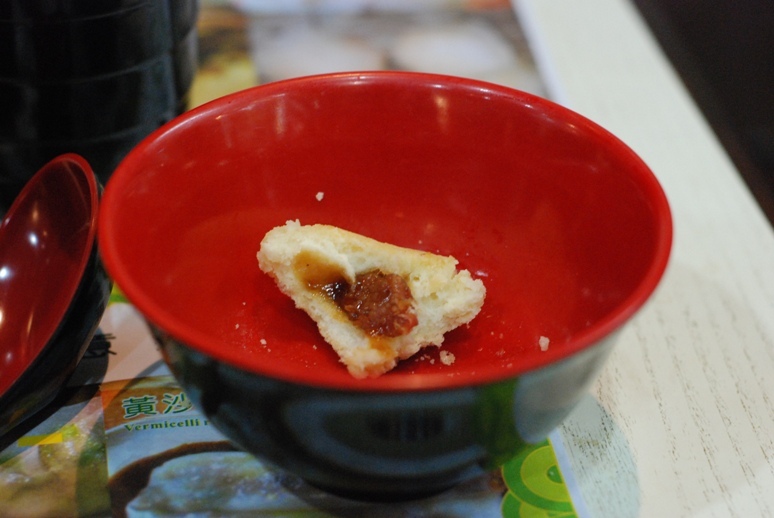 The lovely Amanda got in quick on my #30before30 call for challenges, and pointed me towards this Sydney Morning Herald article about Tim Ho Wan, the world's cheapest one-star Michelin restaurant. Amanda herself is only a few kicks away from having a baby, and so she urged me to feast on dumplings and wontons instead. And so it was that on Saturday 4 September I found myself hustling out of a taxi onto Kwong Wa Street, Mong Kok, a bustling market shopping area of Kowloon. I could tell which tiny hole-in-the-wall shopfront was Tim Ho Wan by the line-up out front. The restaurant stood out between hobby shop after toy shop after model shop. 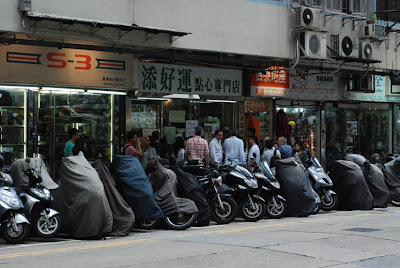 I wandered up past the row of motorbikes to see a well-dressed but stern-looking Door Lady speaking in rapid Cantonese to the 15 or so wannabe diners forming a vague sort-of lumpish queue in front of her. Occassionally she'd scrawl a number on a scrap of paper and hand it to someone; then she'd scribble another number on a blue sheet taped to the glass door; then she'd disappear inside for a while. Occasionally people were let out, and others let it. This was some sort of waiting list. I had to work out how to get on it. As I stuck my head forward to investigate, a man turned to me and said brusquely "There are no more bookings!". He had his fist clenched around a white ticket, and obviously thought I was trying to push in. "Oh," I said, trying to look apologetic. I moved back, and decided my best plan of action was to hang around looking slightly pathetic and hoping someone would take pity on me. Cue Nick and Anthony, two nice English chaps who struck up a conversation. They'd already been waiting about 40 minutes, but in a twist of fate, actually possessed TWO tickets. Another couple they'd been waiting with had to leave to go to the airport. They'd passed the chaps their own ticket; which Nick now surreptiously slipped into my palm. The number on the back was "105". The number on the door was "74". Hmmm. I'd be waiting for a while. Then, Nick and Anthony received the beckoning wave from the Door Lady. I grinned and waved them an enthusiastic farewell. It was like they'd won the Golden Ticket from Charlie and the Chocolate Factory. "Have a wonderful time!" I cried. I thought my own turn would be an hour or so away, so I readied myself to wait with my MP3 player and camera. But lo! The name "Tim Ho Wan" means "Add Good Luck", and Dame Fortune chose this day to smile on me. Around ten minutes after the English chaps went in, the Door Lady came out and sternly surveyed the crowd. Her gaze landed on me. "One?!" she said, at once a statement and a question. "Yes!" I cried, holding out my ticket like a kid on tuckshop day. "I have a ticket!" She nodded, and waggled her finger towards her. "Come." The doors opened, and I raced in as fast as I could to avoid potential death stares from others outside. "Sit there," the Door Lady said, pointing at a seat at the end of a "table" of six. Now the "table" was actually comprised of three small tables, pushed together. The whole eating area was no bigger than 5 metres by 3 metres. No more than 20 diners were squeezed in there. Little tables were pulled out so people could get behind them to sit down. 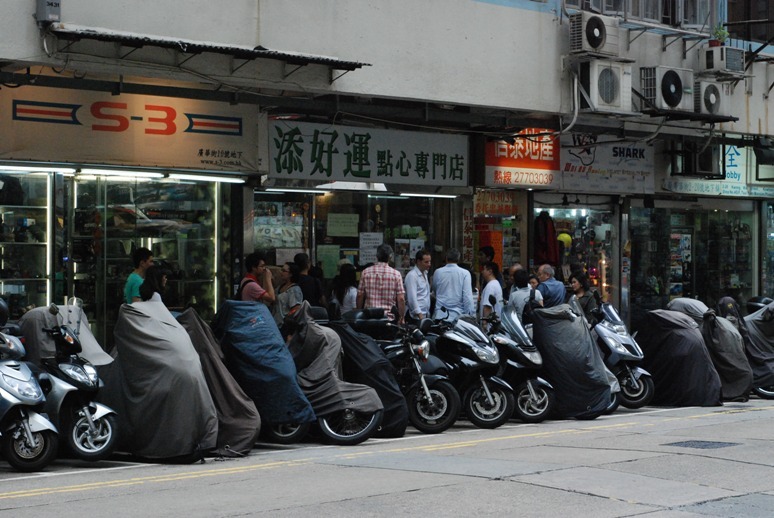 By and large, most shops and stores in Hong Kong are small. But this was astronomically small. I felt like I was in a Lego village, and my bulky backpack and long legs could cause some Godzilla-style havoc. The Cash Register Lady, who was sat just in front of me to my right, next to the door, passed me a small menu and a pencil. All diners crossed off boxes next to the dishes they wanted, then the Cash Register Lady rang up the order and passed you a receipt, payable at the end of your visit. I selected four dishes. As I waited for them to arrive (not long as the menu was relatively limited and the kitchen obviously had a quick turnaround, judging by the number of delicious-looking treats flowing forth into the tiny front room), the Door Lady look at me appraisingly and said "Twenty-one!" "Er," I replied, looking at my menu form to see if she was referring to a dish. She wasn't. I did my best "I'm sorry I'm a stupid foreigner who only speaks one language for shame" face. "No, YOU! You are twenty-one!?" Again, it was half question, half statement. "Me? Oh, am I twenty-one?" suddenly getting it. "No, I am well over twenty-one," I laughed, making a motioning gesture with my hand. The Door Lady pointed at my face. "Your skin," she said. "It is twenty-one." I laughed again. "Mmm-goi, mm-goi!" I replied, using the Cantonese for non-food-related thank-yous. I certainly wasn't expecting to be complimented during my visit. Really, I love rice so much, I will eat it in any form. 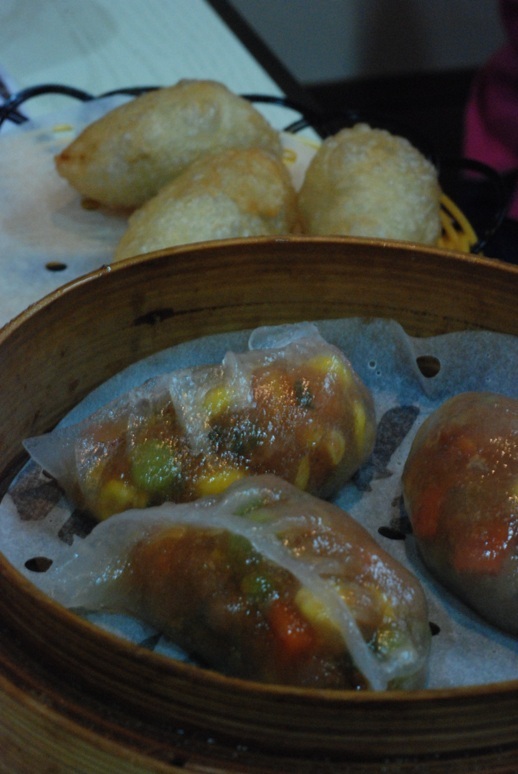 Then - dumplings! Soft beef and vege ones, and deep-fried ones filled with "meat" (that's what it said on the menu. I couldn't work out what type). Beef upfront, fried at the back. It's like a dumpling mullet. 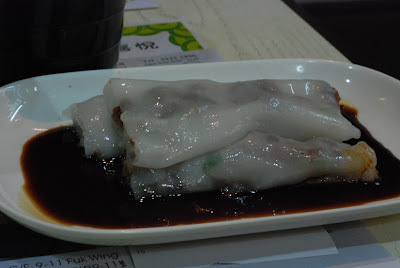 My favourite were the rice rolls - I loved the sticky soft outer shell, and the tang of the pork in combination was delish. I rather ruined myself on the beef dumplings - I popped a whole one in my mouth to begin with, and it was so hot I almost spat it out. It was fear of offending someone, everyone, that I held this steaming dumpling in my mouth, burning my tongue, for about four minutes until it melted enough for me to begin chewing. Tim Ho Wan didn't serve any drinks besides the complimentary watery tea (I assume it was tea), so I took big gulpfuls to help me get back on the dumpling horse. The translucent shell on the beef dumplings was quite beautiful to look at, but I must admit to preferring the deep-fried version. Mmm, crispy. 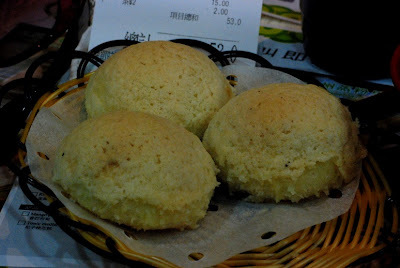 I wasn't feeling particularly full after those three dishes - that job was left to the final dish, the baked buns. A savoury dough outer, with a hint of crispy sugar on the top, hid a treasure trove of deliciously saucy BBQ pork. These were quite amazing, and three of them was almost too many. I ate them all though, wouldn't want to be rude. Remembered to take a photo of the interior just in time. All up, my bill came to 53 Hong Kong dollars. That's about $8 or $9 Australian. 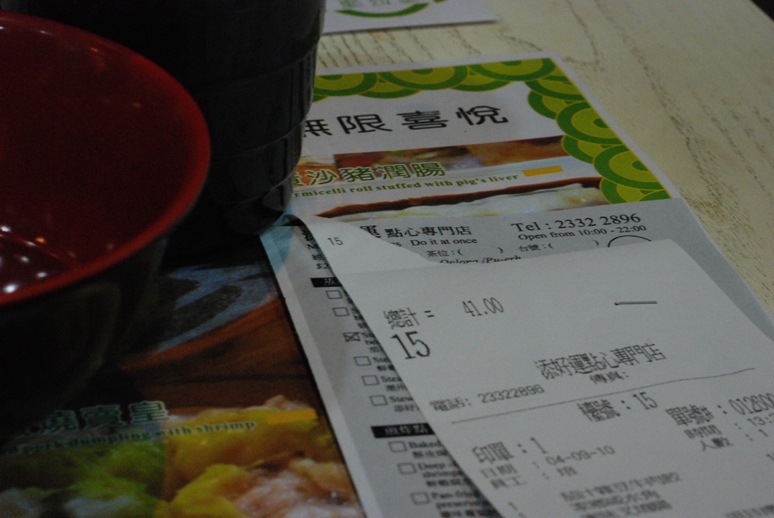 Hence, the cheapest Michelin-starred restaurant in the world. Amazing. And, I felt comfortably satiated for the rest of the day - it was only after seeing Felafel again that evening that I realised I hadn't eaten dinner and my tummy was rumbling a bit. My problem is I'm not much of an expert in wonton cuisine. I can tell you that I thoroughly enjoyed my dishes; but then I didn't eat the vast majority of things on the menu, as many contained prawns or other seafood aspects (I'm not much of a fan), or something called "chicked feet", which sounded a bit ominous. Many of you would know I'm not a very sophisticated diner, so I probably missed the subtleties and flavours that a more advanced tongue would taste. But it was a wonderful experience. I said goodbyes to Nick and Anthony as I left - they'd brought in a couple of cans of beer with them, and were just finishing up. I even took a couple of photos which I've since emailed to them, as memories of their visit to Tim Wo Han. It was the least I could do after they helped me get in! I had no idea you were coming up on thirty from our brief wave past at Felafel. Babyface! Damn it! Now I'm really hungry. Great story, and it made me hungry as well, for dumplings.